Like the Chrysler VZ-6 and Piasecki VZ-8, the Curtiss-Wright VZ-7 was developed in response to an Army Transportation Corps requirement for a 'flying jeep' type light VTOL utility vehicle. Curtiss-Wright's Santa Barbara Division (formerly the Aerophysics Development Corporation) was awarded an Army contract in 1957 for the development and initial flight testing of two prototype aircraft. These vehicles (serials 58-5508 and 58--5509) were delivered to the Army in mid-1958. 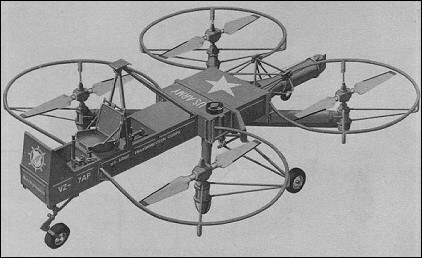 The VZ-7 was of exceedingly simple design, essentially consisting of a rectangular central airframe to which four vertically-mounted propellers were attached in a square pattern. The central fuselage carried the pilot's seat, flight controls, fuel and lubricant tanks, and the craft's single 425shp Turbomeca Artouste IIB shaft turbine engine. Both prototypes originally had ducted fans, though both engines were eventually modified to operate with unshrouded propellers. The VZ-7's control system was also very simple; directional movement was controlled by varying the thrust of each individual propeller, with additional yaw control provided by moveable vanes fixed over the engine exhaust. Both VZ-7 examples performed adequately during the builder's initial flight test programme, and both did reasonably well when evaluated by the Army. The craft were capable of hovering and forward flight and proved relatively stable and easy to operate. However, the design proved consistently incapable of meeting the altitude and speed requirements specified by the Army and both examples were subsequently withdrawn from service and returned to the manufacturer in mid-1960. Just got my first R/C Quad copter this X-mass. With all the know how from 1960 to now, seems this idea is read for a come back.